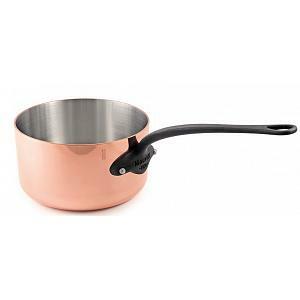 The Mauviel M'heritage M'250 sauce pan with straight edges is made of stainless steel lined, 2.5mm copper and features sturdy iron electroplated finish handles fixed by stainless steel rivets. The Mauviel sauce pan features a convenient non-drip rim and has a capacity of capacity of 1 liter / 1.2 quart with a diameter of 14cm / 5.5 inches. These professional Mauviel cookware pieces are made in France with a lifetime warranty and are used by professional chefs around the world. 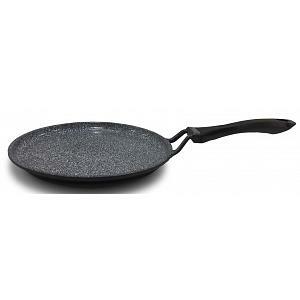 The sauce pan responds to heat changes very quickly and provides the cook with maximum control, which is especially important when you are preparing sauces. 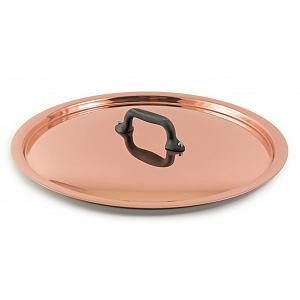 This stunningly gorgeous and ever lasting sauce pan from Mauviel provides you with superior heat conductivity and heat distribution, preventing hot spots that cause foods to scorch and stick.